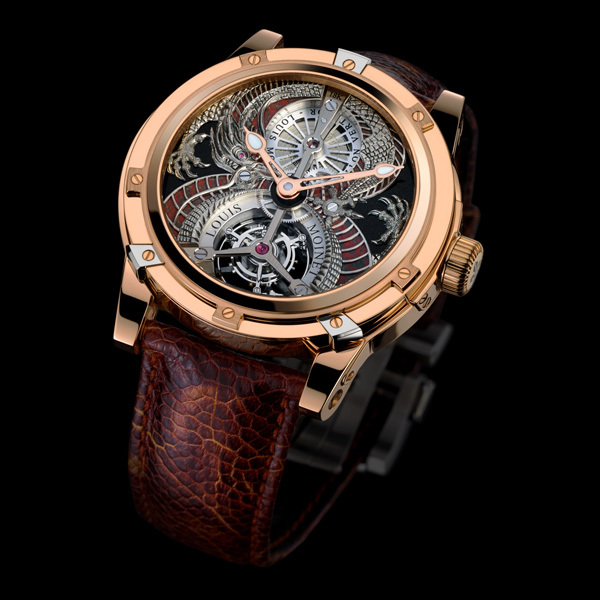 Louis Moinet presents Dragon Tourbillon, his new artistic timepiece in a limited edition of 12 pieces. A legendary creature, symbol of power, the Dragon is a gigantic scaly reptile, capable of flight. Objects representing a Dragon were found in a tomb as early as 3500 years ago! Slender and airy, powerful and revered, the Dragon has the body of a snake, the scales and tail of a fish, the face of a qilin, a fabulous hybrid animal with the antlers of a stag and the appearance of a horse or a stag. He also has the talons of an eagle and the eyes of a demon. The Dragon flies in the sky and generally plays with a pearl of fire. This pearl is believed to give him his power. 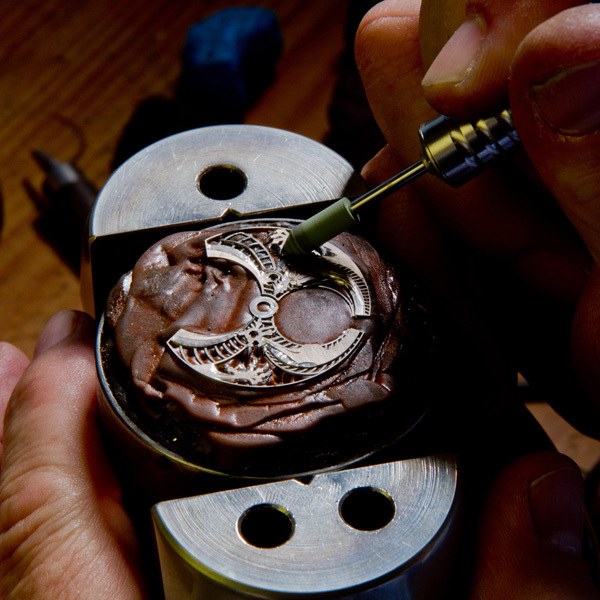 Engraving the Dragon requires more than 50 hours of work, and is done entirely by hand using a piece of 18K white gold. A particular fine jewellery technique – rarely applied to watchmaking – enables the alternation from charcoal-grey to polished gold, and brings the Dragon’s body to life. This is structured in a figure of eight, a number considered to be very lucky in Chinese culture. 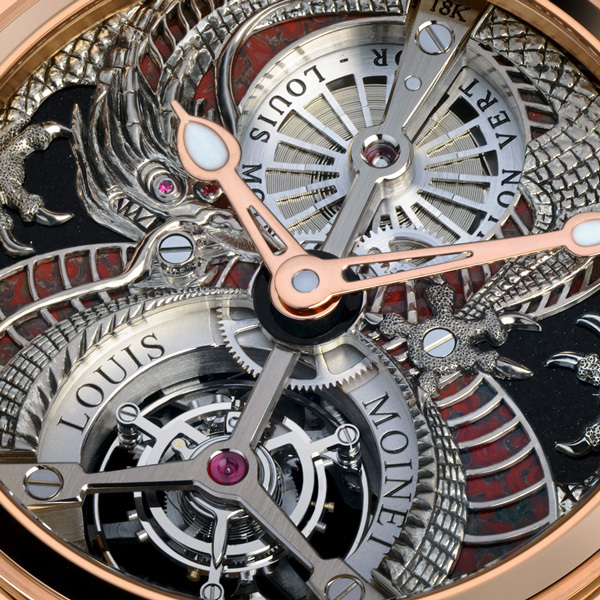 Through its ruby eyes, the Dragon watches the pearl of fire, represented in black jade in the centre of the watch. The body of the dragon has been cut out so as to reveal the fossilised dinosaur bone believed to be around 150 million years old. Is the Dragon, a descendant from the large extinct reptiles of the cretaceous period? History cannot say. But the red and orangey hues of the dinosaur bone certainly help to bring the Dragon to life! The rest of the dial is made out of black jade, which highlights the Dragon’s body in its figure of eight. The view through the DRAGON Tourbillon display-back is almost as spectacular as the dial side, with the ‘octopus spring’ of the winding and setting mechanism taking centre stage. This ingenious component is effectively three springs in one – pull-out piece spring, lever spring and click spring – all radiating from the centre like the swirling legs of an octopus. 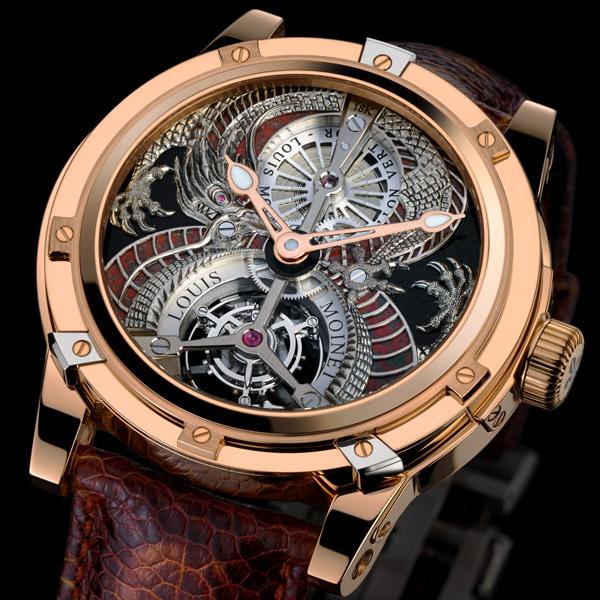 The movement is engraved with Louis Moinet's Côtes du Jura motif. 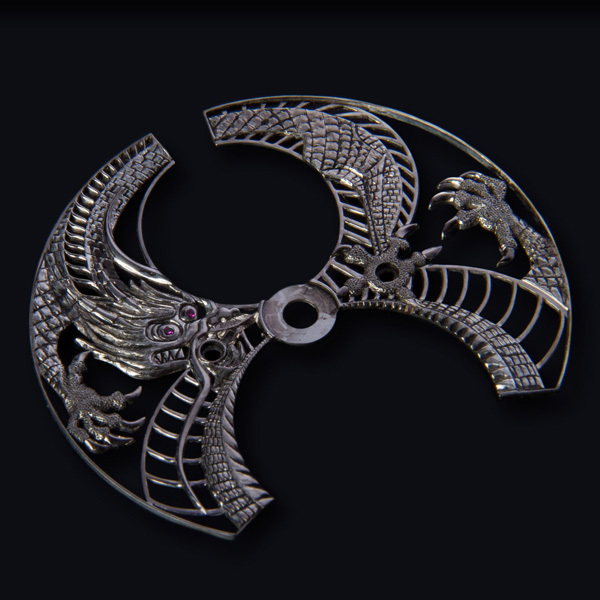 The Dragon is entirely hand-engraved, from a piece of 18K white gold. The rest of the dial is made out of black jade, which highlights the Dragon’s body in its figure of eight.